The app offers a retelling of the Inside Out film, as well as playtime activities for young readers. Disney Publishing Worldwide has launched Inside Out: Storybook Deluxe on iOS devices, offering an interactive retelling of Pixar’s upcoming film, Inside Out, before it hits theaters on June 19, 2015. The app allows children and adults alike to learn more about Riley’s five emotions, Joy, Fear, Anger, Disgust and Sadness, and also explore their own memories and ideas through secondary activities. The base of Inside Out: Storybook Deluxe revolves around the storybook retelling of the film. Users can read on their own, read along with narration, or record their own voice in the app. While reading or listening to the story, some pages offer interactive elements, which may provide short clips from the film, for instance. Elsewhere, the app offers two playtime activities: Memory Spheres and Dream Productions. In Memory Spheres, users upload photos or videos from their camera roll, and can add an emotion to the memory, as well as stickers, weather effects and sounds, including support for recorded commentary. Dream Productions, meanwhile, allows users to create their own dream (think film) productions in the style of Mad Libs. That is, users are provided with an assortment of items, and are asked to choose specific props for their dream based on prompts such as “something heavy” or “a scary animal.” Once the selections have been made, players watch their dream unfold with the props in place. 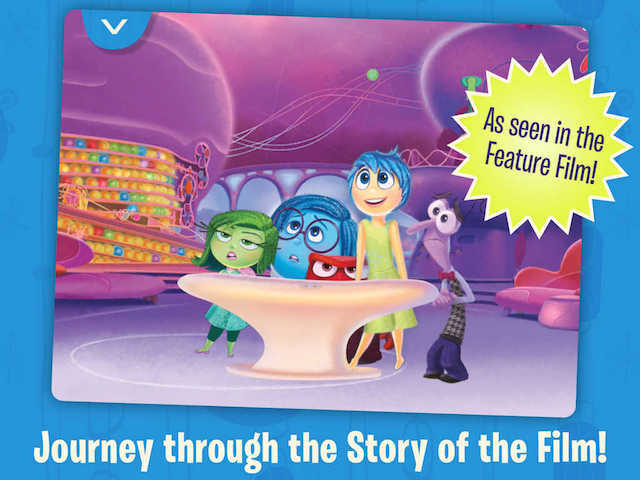 Inside Out: Storybook Deluxe is available to download for $6.99 on the iTunes App Store. As of this writing, the app is No. 167 on the Top Paid iPhone Apps chart on iTunes, and is featured as a Best New App on the platform.